Who doesn’t love a good throwback Peanut Butter & Jelly Sandwich from childhood?! Every now and again at work I find myself craving one and grab a sandwich from food services…despite them being grossly overpriced! It’s a classic favorite with so many people for a very good reason, the combination of salty peanut butter and sweet jelly is simply wonderful. Children and adults alike all love it! 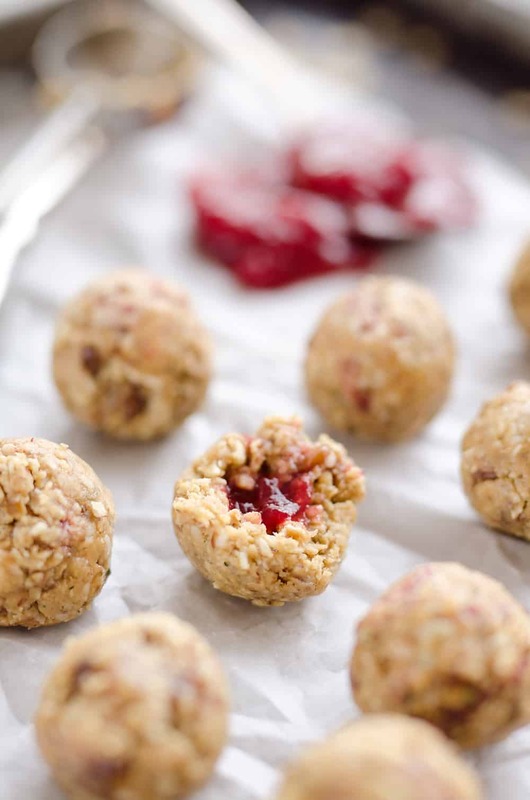 I took this delicious flavor combo and turned it into a healthy no bake snack, these fun PB&J Surprise Energy Bites. 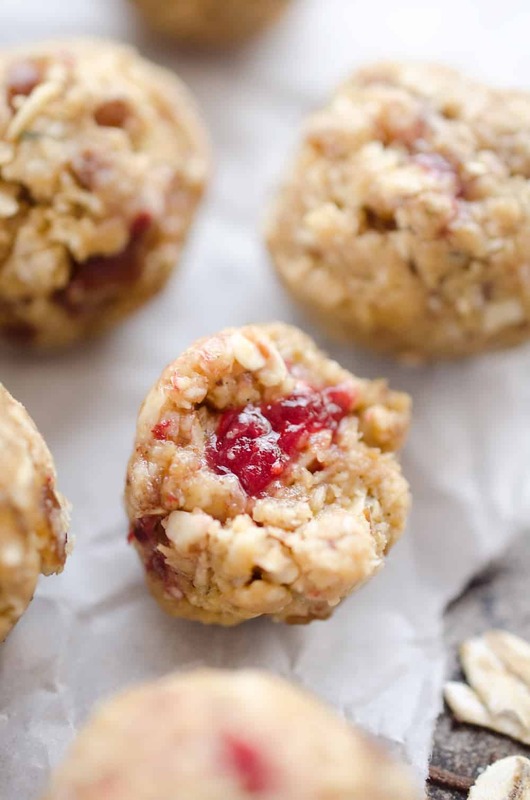 Energy bites are one of my favorite ways to grab a filling snack that satisfies my sweet tooth. 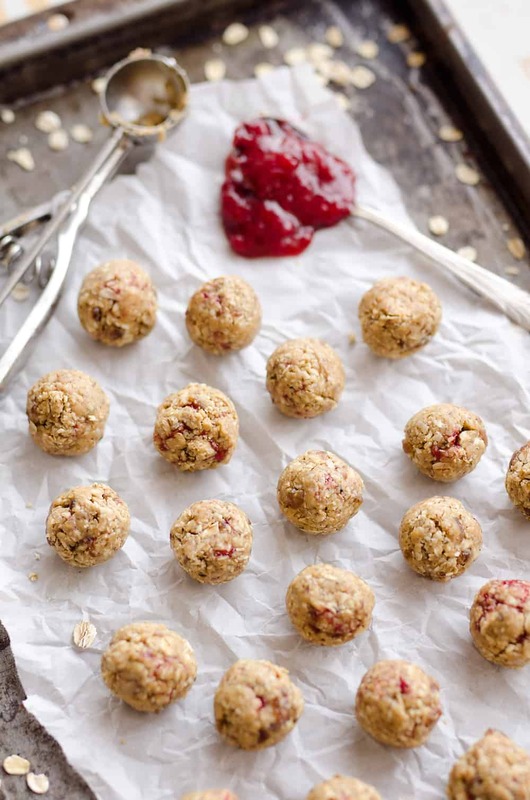 These Cranberry Almond Energy Bites and Blueberry Dark Chocolate Energy Bites are two of my favorites. 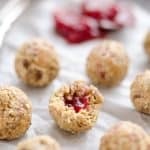 That is, they were my favorites until I made these new PB&J Surprise Energy Bites! I’m basically a big kid at heart, so the idea of PB&J flavors in a snack that has a fun surprise inside is a serious win in my book. I am willing to bet it would be with your children as well. 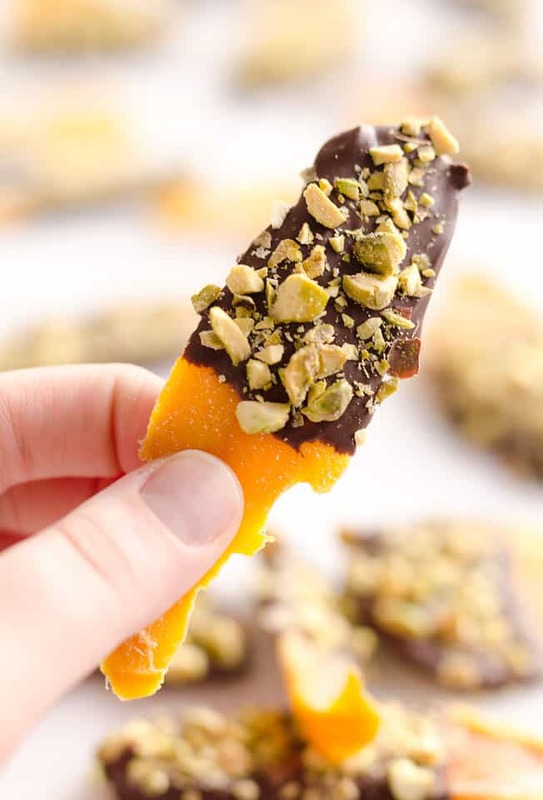 This is an easy no bake snack that you can feel really good about giving your children! 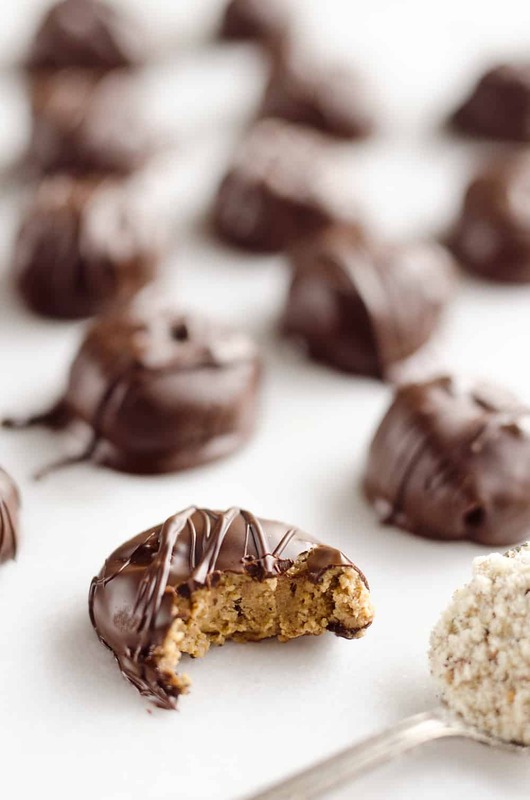 This recipe starts with an easy peanut butter oatmeal mixture made in your food processor. Using a #40 cookie scoop (3/4 oz. ), scoop up some of the oat mixture and using your thumb, press an indent into the scoop as far as you can. Fill the center with a 1/2 teaspoon of your favorite flavor of frozen fruit preserves. 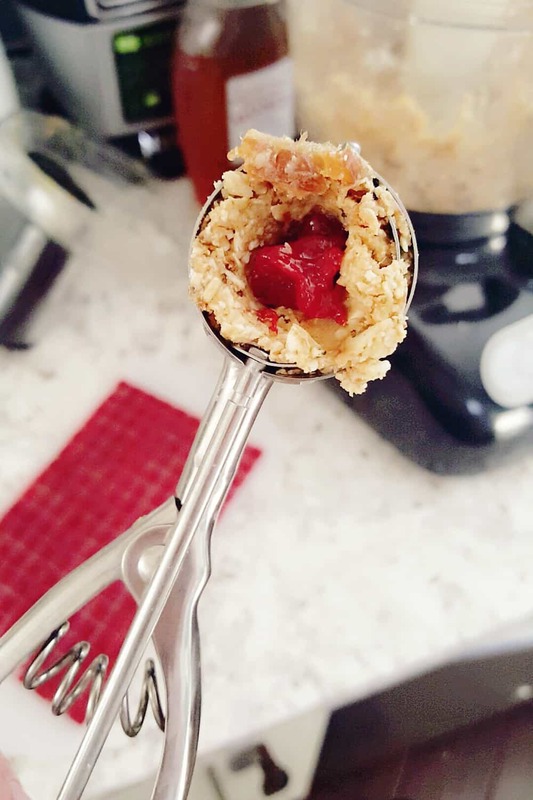 Press the edges of the oat mixture over the jelly and release it from the scoop. In your hands gently roll it into a smooth circle. 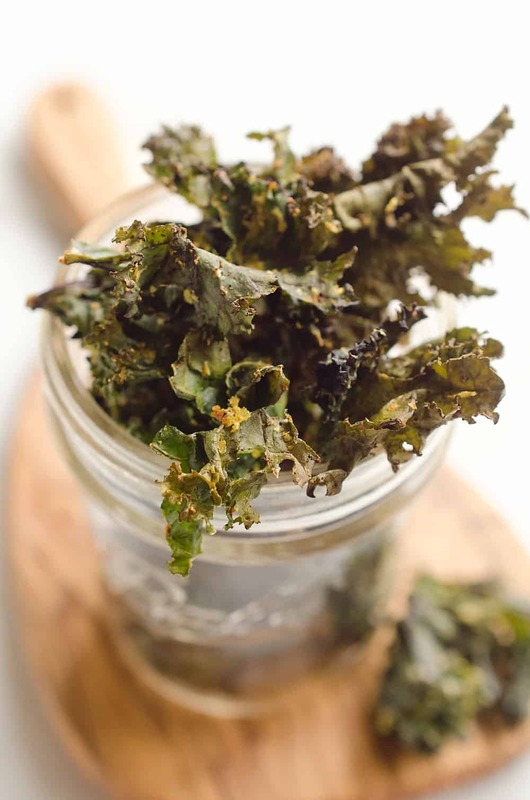 Store the energy bites in an airtight container in the refrigerator for up to a week or pop them in a resealable bag and store them in the freezer for months. 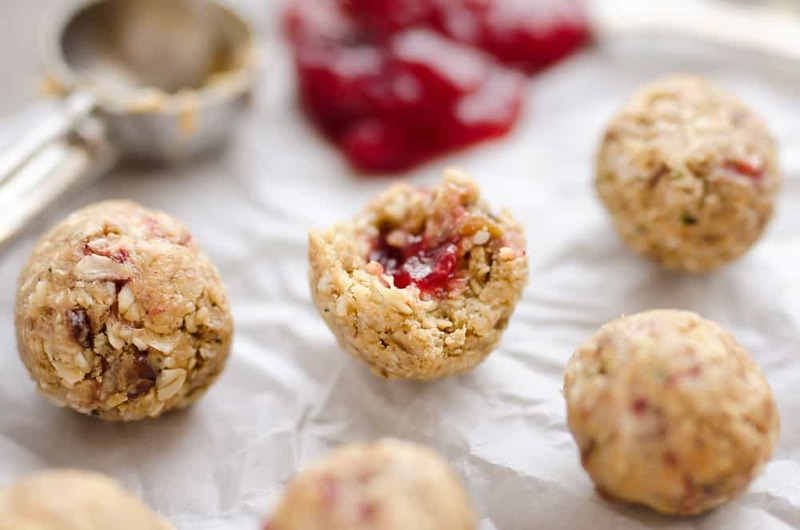 When I store my energy bites frozen, I just pop them in the microwave for 20-30 seconds and they are an easy and healthy snack ready to go! In a food processor, add the almonds and dates. Pulse until the dates are chopped finely. Add the flaxseed, hemp seeds, nut butter and honey. Pulse until the mixture is smooth. Add the old fashion oats and pulse until the mixture is well combined. Scrape the sides and bottom of the food processor to ensure all of the ingredients are well incorporated. Pulse a few more times to ensure a smooth mixture. Using a #40 cookie scoop (3/4 oz. ), scoop up some of the oat mixture and using your thumb, press an indent into the scoop as far as you can. Fill the indent with a 1/2 teaspoon of frozen fruit preserves. Press the edges of the oat mixture over the jelly and release it from the scoop. In your hands gently roll it into a smooth circle. Store in an airtight container refrigerated for up to a week or frozen for three months. Can you use regular jelly? It might not thicken quite as well when you freeze it, but it should work. There are no dates in the recipe but they are referenced in the directions. Regular nut butter or natural?